George Osborne is about to put UK fiscal flexibility in another straitjacket. Fresh from pledging not to raise taxes in the next parliament, the chancellor will use a speech on June 10 to announce legislation committing governments to run budget surpluses – a move reminiscent of the German government’s self-defeating “debt brake”. It’s further proof of the increasing bifurcation between public opinion and mainstream economic principles. In the popular conception, governments and households are both better off if they don’t have to borrow. On this basis, the 88 billion pound UK fiscal deficit is simply bad. It should be paid off as soon as possible, and certainly not increased. In 2009, such plain thinking led Germany to enshrine a “debt brake”, which puts a legal limit on the ratio of deficits to GDP. Osborne’s proposal sounds even more constraining. That may seem like common sense, but almost all economists demur. John Maynard Keynes clearly explained in 1936 that government deficit spending can limit recessions, and his theory has been mainstream wisdom for at least half a century. The resulting debts are not necessarily dangerous. Economists from the International Monetary Fund recently argued that policies to reduce debt – as opposed to letting GDP increases reduce the weight of interest payments – were “undesirable” if countries have sufficient fiscal space. In fact, governments are not like households, because government spending can mobilise otherwise unused resources, enriching everyone. But that is a sophisticated idea. Politically, Osborne is on safe ground. His Conservative Party won last month’s general election, in part arguing that a grinding recession was caused by the previous Labour government’s excessive borrowing, not by a global financial crisis. Voters either don’t understand or don’t trust economic wisdom. If the UK economy keeps growing, the debate may not matter too much. But with UK productivity growth slow, an enlightened government would use historically low interest rates to fund investments – especially as the IMF suggests the UK does indeed have ample fiscal space. Making a virtue out of copying highly questionable Germanic fiscal masochism seems at best misguided. 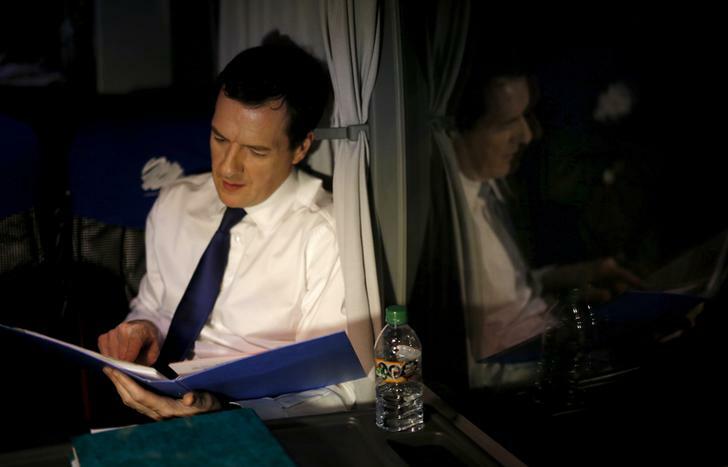 Britain's Chancellor of the Exchequer George Osborne works at the back of the Battle Bus as it drives near Nottingham, Britain, May 5, 2015. The UK is to draft legislation to compel future governments to spend less than they raise in taxes during normal economic times, according to extracts of Chancellor George Osborne’s Mansion House speech reported in advance by Reuters.